If you haven’t spent anytime in downtown Boston in recent years, you have yet to experience one of America’s greatest waterfront cities. The Boston Harbor Hotel has dominated this location in five-star glory since 1987 and can serve as your home base for a fantastic family vacation. I had called ahead and asked, “Do you have child-sized robes? “Yes, ma’am; we even monogram them with the child’s name. Can you spell the names of your children please?” That certainly set the bar higher. The hotel is a designated a Preferred Family Hotel of the Preferred Hotel Group. We arrived on a beautiful late summer day when the sun was shining, and it didn’t climb above 76 degrees. In that weather, Boston rivals any city in the world. The Boston Harbor is on Rowes Wharf and is surrounded by boats, the New England Aquarium, and the Rose Kennedy Greenway. 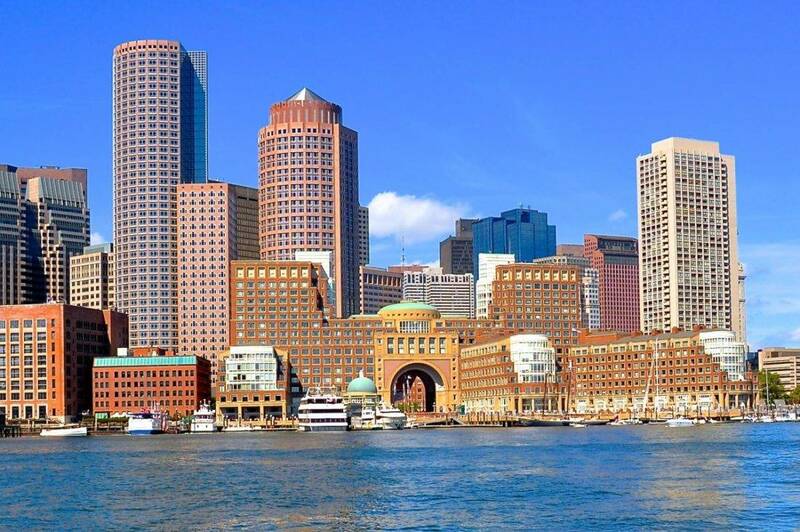 You can even arrive or depart the hotel by water taxi to and from the Boston Airport. The common spaces of the hotel are formal and traditionally decorated in nautical themes, but I don’t mean Red Lobster decor. At check in, the staff offered my children a choice of a plush toy and made my children feel very welcome. Our suite was beautifully decorated and offered spectacular views of both downtown and of the Boston harbor. My children loved their robes and slippers, and a few puzzles and books in the room made their welcome feel exciting and personal. There was enough drawer space for a family, and I loved the extra amenities in the bathroom like travel-sized stain remover wipes and Woolite. The hotel does use the horrible sensor-triggered mini-bars, which is my nightmare. I had to call room service for them to come and remove the items after my toddler couldn’t leave the bright blue (his favorite color) liquor bottles and jar of gummy bears alone. Within fifteen minutes of check-in, I had incurred a three-digit mini bar tab, but fortunately the front desk understood what was happening in my room, and it wasn’t a Long Island Iced Tea with gummy bear iced cubes. I was dying to get outside and walk the harbor walk that connects the hotel to the New England Aquarium, but my kids were starving. The room service menu offered the standard kids’ choices, but my beef tenderloin open-faced sandwich was excellent. I changed my toddler’s pull-up after lunch to discover that the stack I had set next to my suitcase remained on my bed at home. I called guest services and a very polished young man answered, “How may I help you?” I paused, “I sort of have a diaper emergency.” “Oh dear,” he replied with emerging panic. A member of the housekeeping staff had coincidentally shown up that moment, and I asked her about the diapers. “Would you like to wait here while I get you some?” She asked as both our eyes trailed to my son standing on the sofa buck naked. “Uh, yes, I think we can wait here,” I replied without a hint of sarcasm. So far, I was very impressed with the Boston Harbor Hotel in how prepared they were to serve their littlest guests. The hotel has an indoor pool, spa, and fitness center on the lower level. Their hot tub is one of the biggest I have ever seen. There are two restaurants in the hotel. The Rowes Wharf Sea Grille is the more casual option with indoor and outdoor seating for families. Meritage is the restaurant’s formal restaurant that becomes very family-friendly for holiday meals, though. In the summers there are many additional events at the hotel to enjoy its waterfront location, like concerts Tuesday through Thursday and Friday night films. It is a well-attended series by locals, too. In the winter, the hotel transforms its rotunda into an ice-skating rink and offers numerous family holiday events like a skate with Santa and a holiday tea. When we left the hotel on the harbor side, we saw the gazebo used for the hotel weddings. It was a Friday and not set up yet. I told the kids who had an excessive amount of energy to go inside the little building and scream as loud as they could to get their wiggles out. With the doors shut, all those of us outside couldn’t hear a thing, but I saw them run in circles with big open mouths, following orders. 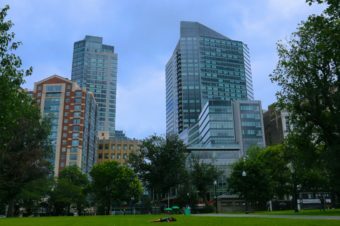 The Rose Kennedy Greenway is just outside your door. This urban park space replaces an above ground expressway that was put underground in the well-known Big Dig project. Some stretches are mini parks bordered by trees and tall shrubbery to feel like private gardens, others are more open spaces, and there are numerous art and water installations. Food trucks park around the area, and the Cookie Monstah warranted a stop. Those were big cookies. I couldn’t let my own children order this ice cream sandwich when I saw how big it was, but luckily the girl ahead of us let me take a picture of hers. The Greenway Carousel is one year old, a newly constructed carousel of animals native to Massachusetts. We loved our ride, because the animals themselves were works of art. After a few twirls to vintage carnival-like music, someone felt we all needed a mood change of sorts and Queen’s “We Will Rock You” came on very loudly. Mist fountains, water fountains, gourmet food trucks and classic rock merry-go-rounds make a perfect Luxe Recess at the Boston Harbor Hotel. Ah Boston, you are wonderful. We were guests of the Boston Harbor Hotel, but the the opinions expressed in this article are entirely our own.